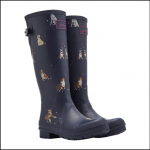 These Joules socks are made from a Bamboo mix which has more benefits than you can shake a stick at, such as Hypoallergenic, Thermo-regulating and other long scientific-sounding words. Most importantly they will take care of your hard-working feet long into the day and available in an assortment of three new unique designs. 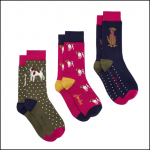 Assured to not only revitalise your feet but a sock drawer too, the perfect treat for yourself or any dog loving family member or friend. Like these Joules Brilliant Bamboo 3pk Socks? 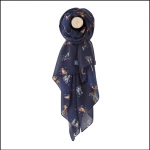 Why not browse our season Joules co-ordinates to complete your look.